A unique, simple, green and smart way of providing water to your employees, Skywell is a revolution in water creation. The atmospheric water generator produces pure drinking water from the moisture contained in that air we breathe, all that’s needed to produce the water from Skywell is a standard electrical outlet! Skywell takes in air and collects the moisture contained within it, through condensation. Then it uses a six-stage water filtration system, ultraviolet purification and ozone treatment to remove impurities in order to create clean drinking water. Before serving, the water dispenser’s built-in monitoring systems continuously inspect every drop to ensure that the water produced is of exacting quality and clarity every time. 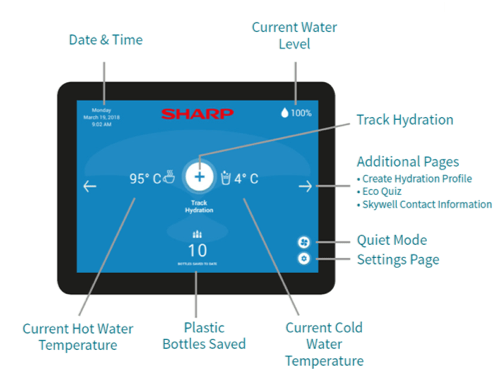 Through Sharp, Midshire has access to the Skywell 5TE, which generates up to five gallons of water per day. The Skywell not only produces cold drinking water, it also replaces the need for a kettle, as it produces hot purified water too. Is the Skywell Environmentally Friendly? Environmentally and socially responsible, Skywell® re-imagines the future of drinking water with a commitment to help reduce usage of plastic and its carbon footprint with no pumping, piping, shipping or delivery. • Environmentally friendly – No delivery truck—saving fossil fuel and reducing pollution.